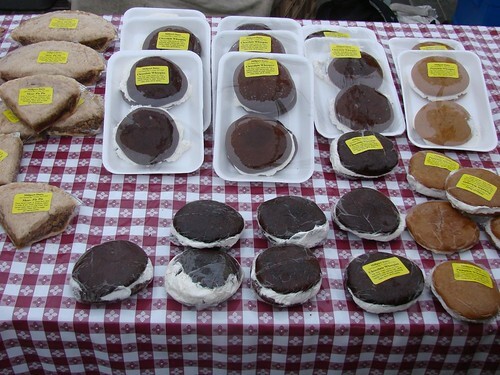 I've been tracking the whoopie pies of midtown and it was exciting to find whoopies from an Pennsylvania source. 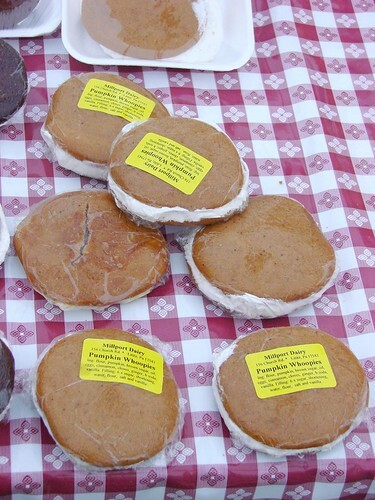 I was raised on New England whoopie pies and up until now I don't know that I've ever really had one from the Lancaster area. These whoopie pies were $1.50 each or $3.00 for 2, which doesn't really seem like that exciting a deal since it's just twice the regular price, but unless my eyes were deceiving me, it looked like the wrapped double packages of whoopies were a little bigger than the single whoopies so maybe it is worth it. The pumpkin whoopie pie was wonderfully moist and spicy. Really delicious. By the time I got around to eating the whoopie pie it was already the end of the day and my wee pies had been a bit squished in transit. Cream addicts might be disappointed that the middles didn't have a little more stuffing, but it felt like a pretty good balance to me. If it hadn't been so hot and humid (and the whoopie pie hadn't been squished) I wonder if the proportion of the filling and the way it spread out might have been more optimal. Oh well, I guess I'll just have to try it again. Such a hardship. 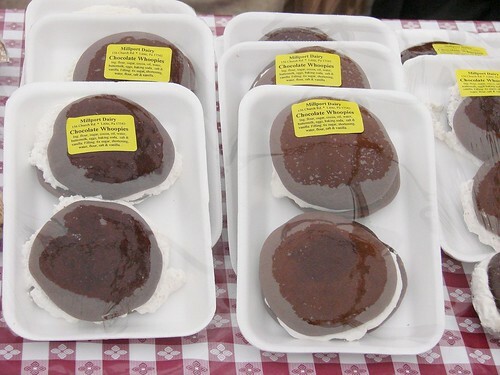 The chocolate whoopie pies were good as well. The cake was also moist, through I wouldn't have minded if it was a little denser and just a little more chocolatey. I would definitely rate this above the whoopie pies served on the concourse level at Cucina and Co. They are not quite as large as the Cucina whoopie pies but there's no need to wait until baked goods happy hour at 4:00pm. These whoopie pies are only $1.50 all day long. 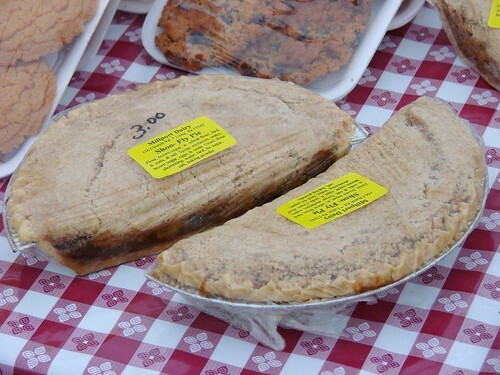 Lastly, I picked up a piece of Shoo-Fly Pie to bring home to share with Lawman. I can't have nuts so for me, Shoo-Fly Pie is like a nutless pecan pie substitute with crumb topping and how can you not love crumb topping?! Millport's Shoo-Fly Pie was tasty and not as sweet as you might expect of a pie whose filling is made from brown sugar and molasses--the crumbs and crust actually cut the sweetness. Still with lard in the crust and the topping it's pretty rich, so you might want to make sure you have a cold glass of milk and a friend to share it with. Pie quarters go for $1.50 and pie halves for $3.00. You have to check to see when the Pennsylvania Dutch are there. Not everyday. 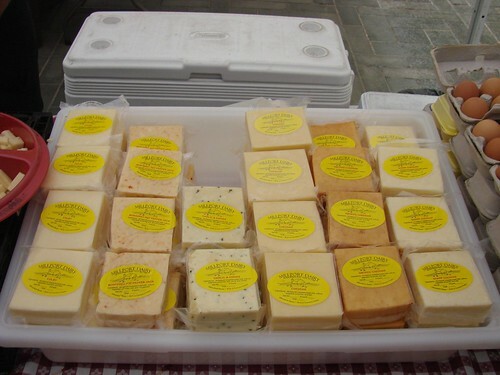 Just a little closer to home, in Flemington, NJ there is a Pennsylvannia Dutch market open Thurs, Fri and Sat. The last Saturday of each month (except January). They roast a pig and serve it on the most delicious little powdery rolls with some very tasty sweet BBQ sauce. I LOVE the Reading Terminal Market! Thanks for the heads up about the Pennsylvannia Dutch market in Flemington!